Da Big Carnival fi da likkle ones! Join Rastamouse, Scratchy and Zoomer in a unique audio adventure that takes Da Easy Crew and friends on a musical journey to perform at a very special Carnival for 'likkle ones'! With music composed by Andrew Kingslow and featuring the voices of Reggie Yates, Cornell John, Sharon Duncan-Brewster and William Vanderpuye. 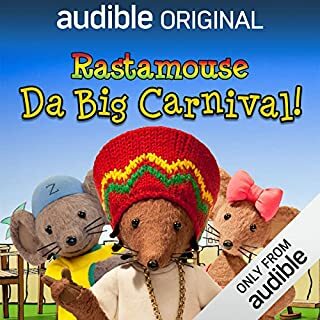 Da Big Carnival Fi Likkle Ones is an exclusive experience that brings the magic of Rastamouse to Audible. If you could sum up Rastamouse in three words, what would they be? What other book might you compare Rastamouse to, and why? No less than the greats of Tolstoy, Austen... Oh alright maybe not. It's a kids book. The narrators manage to make each characters voice distinctive across the range of different ages, and still clear enough for everyone to follow. From President Wenslydale to Scratchy to Rastamouse himself. Dwayne trying to say the word commonmentary. cominentary... sorry commentary. Be prepared for a bit of jigging if the little ones are listening to it about as Rastamouse is nothing without music. And there are bits of steel pan and reggae interpersed between the scenes. Bandulu's cheese pie song stands out. Your ikkle ones are going to love this. Horrendous Narrator - where is Nigel Anthony? A better narrator would have improved this rating immensely. 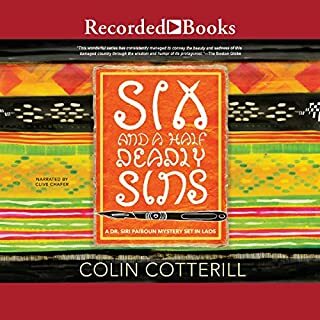 Would you be willing to try another book from Colin Cotterill? Why or why not? Yes there's a lot more to be had. Would you be willing to try another one of Clive Chafers’s performances? I would rather be dragged down the Mekong river by my ankles from a Yak cargo plane than give mr chafers another bite of the cherry. Two years after the un-hatching of Callayan President Neiland’s plot to make the capital city of Tanusha the center of the Federation, Callay is under siege. So begins the third installment of this gripping trilogy from an exciting new sci-fi author. A powerful faction of conservative Fleet captains has surrounded Callay, at Earth’s behest, and is threatening a blockade - or worse. A fearful Earth does not wish to lose direct control of its precious war machine, and there are fears of civil war. A fitting end to the first trilogy. 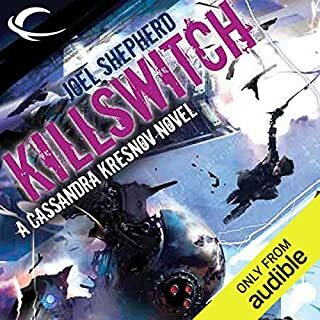 Would you consider the audio edition of Killswitch to be better than the print version? I've not "read" any of Joel Shepherds books, I discovered him through the good graces of Audible and having a credit burning a hole in my virtual pocket. If you’ve listened to books by Joel Shepherd before, how does this one compare? As always there is that fascinating south asian fusion that Joel fills the background with. But the confusing repetition of Callay (the planet) the Xiaobahn/Shoban* River Delta (the region) and Tanusha (the city) can make it harder work than it need be to keep track of where the action is. The politics of the world, always a consideration for the author is fully realised. Although the blind insistence of the SIB a government security agency (a somewhat less than competent CIA analogue if you will) that they must doggedly harass the main character is grating. As they seem like one trick political ponies, rather than a real threat to Cassandra Kresnov and her allies in the defence force. As you may have realised there more politics in this one than the previous two, and as well as the local stuff on Callay there is the wider schemes of the Federation and League coming to a tentative post-war peace (of sorts) and the moving of the Federation capitol to Tanusha. There isn't one scene but the fact that "civilianisms" keep on suprising Cassandra is delightful. Such musings as on the difficulties of having long hair when you need to access an interface implant. We also see just how dangerous high-designation GI's are when working together "It's just no fun" as Rhian Chu one Sandies few surviving Darkstar squad mates puts it upon dispatching a rogue automated tank. Rhian Chu's reaction to the threat against the children in the Hacienda. Sandy might be the planets most dangerous soldier but Rhian is like a tiny asiatic mary poppins, if mary poppins was a lethal combat android/gynoid and had access to automatic weaponry. Take the finest organic creative talents, stew them over an apocalyptic dystopia, then carefully refine and mature in optimism. Stir in a balanced amount of green and blue sky thinking. 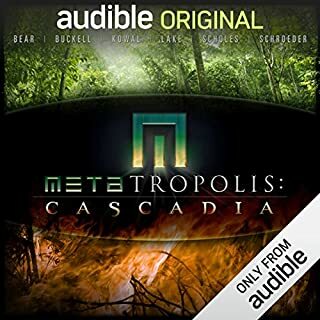 And you'll have Metatropolis: Cascadia. As the follow-up to the original Metatropolis it benefits from the lessons learned there. A tighter geographical focus and a shared backstory that ties in several pieces. A capable crew of narrators; all of whom are Star Trek alumni, adds a little more geek credibility to garnish the dish. And the duties are ably handled. There is one common ingredient to the stories and it's a rare one. Hope. In sci-fi there's a lot of endless boots stamping on faces that the protagonists have to fight; here that boot has landed, moved on and this is what happens afterwards. Quite a while afterwards. This means some of you are going to hate it. That's okay. The two key pieces for me are The Bull Dancers by Jay Lake which ties into the backstory more so than the others. And the fascinating Water Into Wine by Mary Robinette Kowal. Don't let anyone tell you that Viniculture isn't fertile ground for speculative writing. Overall a fine body of work and one which I hope will bear further fruit.